Sorry for the lack of words lately. I’m in the middle of a big move, but will be back shortly with more photos, recipes, and words! Interesting! I like dates. I'm going to have to give this a try! Love your pancakes - a very inviting pic. :) Have a smooth sailing move. Looks yummy, can't wait to get the recipe and test these. Godspeed on the move. I'm retired military and God how I dreaded, PCS moves. Oh the pancakes look so delicious! I love trying different kinds of pancakes and this one is definitely on my list of pancakes to make! 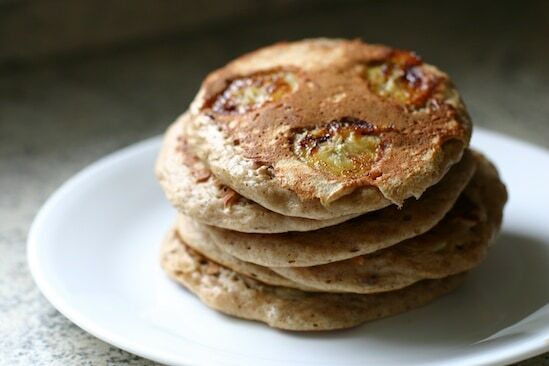 These look so good, I love how the bananas kinda caramelize. These look fantastic. Impatiently waiting for the recipe!. Yummy. It let me miss my mum's pancake. Amazing. I really wanted to make some hearty breakfast cereal this morning, until this picture! :) A touch of blueberry syrup on those would be divine. WOW that looks totally delicious! This is one I'm going to try today though, for sure. Delicious ingredients like these certainly would make delicious pancakes. Would love one or two. Yum. These look delicious! I was just browsing the Web and came across your blog. I love it. I made pumpkin walnut pancakes for myself this morning. They hit the right spot. How were yours?I can relate to moving and not having time to write. I moved into my new place a week ago, and I didn't post ANYTHING on my blog for a while. I have to make up for it now, though, right? Beautiful pancakes! You're moving? You have my empathy:) Trying to play catch-up after a very sad time but always look forward to seeing your blog - and your delicious photographs! Looks good. Wouldn't mind a pancake right about now :) Good luck with the move. good luck with the move it is not easy. the date nut has potent cancer-fighting properties. this is a delcious and healthy idea! but could we get a recipe for it?